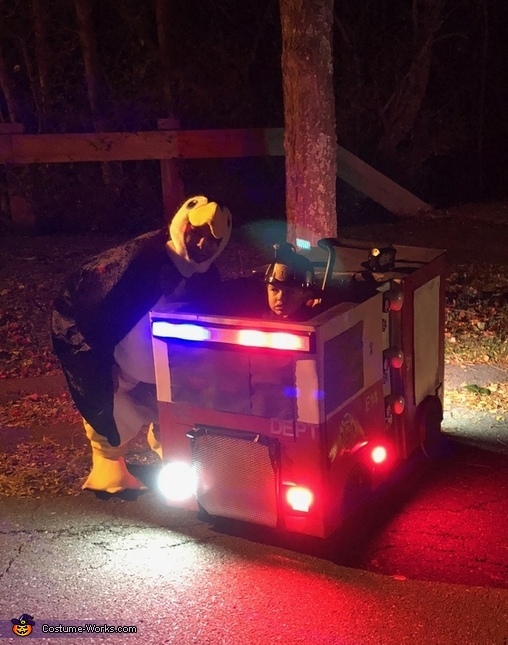 Our son Noah is 3 ½ and has Acute Flaccid Myelitis and this was his first Halloween using his wheelchair. Noah very much wants to be a firefighter when he grows up and my wife and I fully support him in that goal. Noah does intensive physical therapy 3 times a week to regain his mobility and we’ve encouraged him he can do anything he wants if he’s willing to put in the work. So therapy has become his fire fighter training and it’s been a great motivator and he’s worked so hard. So not surprisingly Noah wanted to be a firefighter for Halloween and we wanted to reward his hard work with an awesome firetruck costume so he could be a real fire fighter for at least one night! It was my first time building anything like this and had I known what I was getting myself into I probably wouldn’t have been so ambitious but I wanted to do something really special for Noah. I researched everything I could to figure out how to pull everything together and thought I was fully prepared. The basic frame was PVC pipe that I covered in Cardboard (for a base) and then covered in EVA foam. The EVA foam had two layers, one was old floor mats to build depth and then I used 2mm Foamies around the entire thing to try to give a cleaner overall look. I laid down a base of plastidip and then spray painted red white and silver. I intended to clear coat it too but ran out of time. I ordered decals and lettering online and a firefighter friend of ours provided a couple of additional stickers (the 911 memorial sticker and the boston strong ribbon). The windows are black construction paper. I also ordered pressure gauges and handles and used some left over PVC parts to make the side panels. Monday night I stayed up all night wiring the lights and siren. It has a red and blue light bar and then red and white headlights and tail lights as well as red running lights on the side. All of those are hooked up to two strobe controllers so they can have independent patterns. There’s also two spot lights on top with a separate switch. The final piece is a siren/megaphone combination. I had to stuff it with socks to get the volume down because it’s super loud!! I used small 12V batteries to power everything. I used 4 casters during construction to hold everything up but in the end only left the back two for support and attached the front of the costume to the wheelchair using zip ties. Noah was so excited to see his fire truck and had the time of his life driving around in it. All the kids (and parents) stopped to check out the firetruck and Noah ate up the attention. Several people who had seen the lights in the distance thought it was an actual emergency vehicle. Noah kept calling over to the kids and telling them to come look at his firetruck!! He was so proud to be a fire fighter that night!! I wish I could post a video so you could see everything in action it was a blast watching him roll down the street lights and siren blazing! !